Ahmedabad: Congress president-designate Rahul Gandhi began phase 2 of Congress' campaign in Gujarat today. 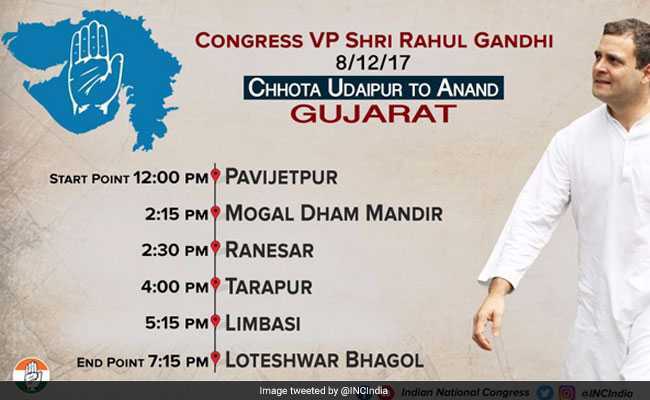 His campaign for the second phase of Gujarat election 2017, which began at noon today, will traverse almost 150 km from Chhota Udaipur to Anand. After addressing rallies at Pavijetpur, Mogal Dham Mandir, Ranesar, Rahul Gandhi has arrived at Tarapur and from here will travel to Limbasi and Loteshwar Bhagol. The Congress is engaged in an uphill battle in Gujarat where it hopes to dismantle the 22-year-long BJP reign. The two parties - BJP and Congress - never leave any opportunity to launch scathing attacks against the other - from calling names to calling out the promises that are yet to be delivered. While the BJP has likened Rahul Gandhi's imminent elevation as Congress chief to the "Aurangzeb Raj", veteran Congress leader Mani Shankar Aiyar has called PM Modi a "neech aadmi". An apology and a suspension later, the Congress embarks on phase 2 of their rigorous campaign in Gujarat today. Rahul Gandhi, who had recently said that Gujarati food is making him fat, was seen relishing a plate of pav bhaji today at a local stall in Tarapur in the Anand district of the state. Mr Gandhi can be seen smiling while the bhaaji gets made and he shakes hands with the numerous people standing around him. Rahul Gandhi says, "I won't lie and say that everyone will receive Rs 15 lakh in their bank accounts but when we come to power here, people will feel that their voices are finally being heard after 22 years." 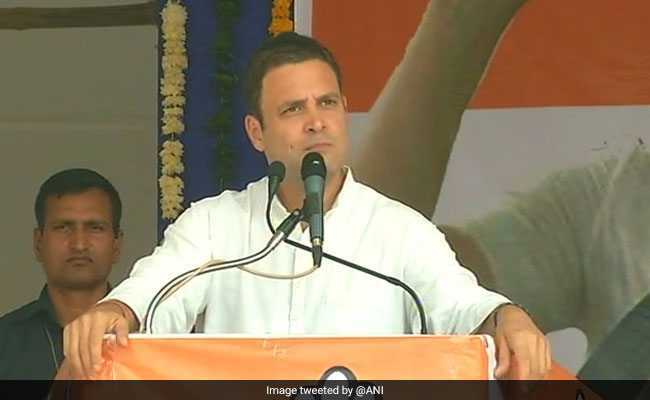 In Gujarat, Congress will replicate the noble initiative of canteens in Karnataka where food is available for everyone at minimal prices, news agency ANI reports Rahul Gandhi as saying while addressing voters in Anand. Urging voters to read the Congress manifesto, Rahul Gandhi says, "We'll increase your salaries. If salaries of others can be increased, salaries of teachers can also be increased. The money that we put into MNREGA is the money put into a TATA Nano Factory by BJP." Speaking at a rally in Anand, Rahul Gandhi says, "Arun Jaitley released the BJP manifesto only after we asked. 'We won't release till the Congress asks', this is their arrogance. Modiji says he works for the Patidar community. Did he come when your women were being beaten up? Talks on Patidars and Sardar Patel come up only during elections." 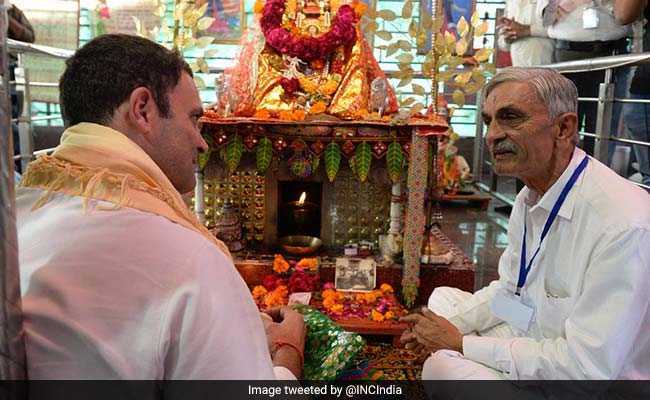 Rahul Gandhi prays at the Mogal Dham Mandir in Ranesar, Gujarat. Rahul Gandhi is greeted by supporters at his rally. "Congress party hindustan ke PM ki kursi ka aadar karti hai. Aur congress party mein galat shabd prayog karke koi bhi PM ke baare mein nahi bol sakta. Modi ji humare baare mein kuch bhi keh sakte hain. Isliye humne Mani Shankar Aiyar par sakht karyawahi ki," says Rahul Gandhi, speaking about Mani Shankar Aiyar's "neech aadmi" comment about PM Narendra Modi, reports news agency ANI. Confident of a Congress victory in Gujarat, Rahul Gandhi says, "Aandhi aa rahi hai!" 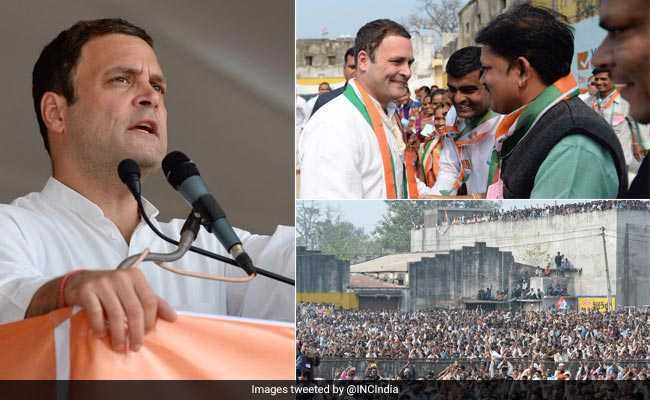 At Chhota Udaipur, Rahul Gandhi says Congress party will make policies to waive of farmers' loans within 10 days of winning Gujarat elections, reports news agency ANI. "BJP aapke liye kya karna chahti hai unhone woh aapko abhi tak nahi bayata hai, manifesto abhi tak tayar nahi kiya," says Rahul Gandhi, reports news agency ANI. Rahul starts addressing his first rally of the day in Chhota Udaipur. Rahul Gandhi's Gujarat campaign schedule for today.